'Roryu' ( Hiroshi Shimizu by Carol Warner, R. 2011) SPEC-X (Pseudata); 40-43", Midseason bloom. Yellow, Falls lightly veined red, small standards more heavily veined red; deep red eyelash pattern almost completely covers yellow signal. 'Gubijin' X unknown (mixed JI pollen). Draycott 2011. Translation: "An old dragon". 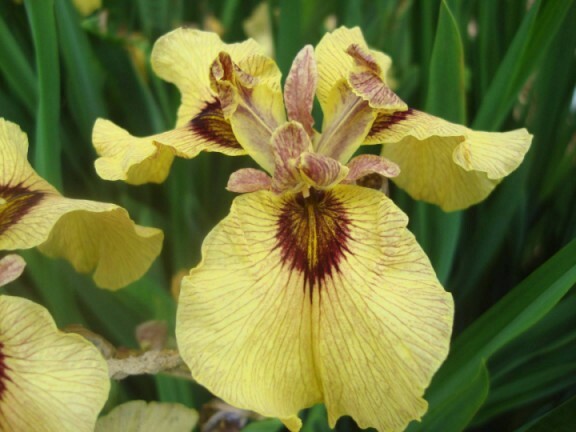 From Draycott Gardens catalog, 2016: RORYU (Hiroshi Shimizu, 2011) 40-43" M. This tall beauty opens from a burgundy bud which shows a distinct yellow rim. With two branches and a terminal it can open nine flowers in succession. Lemon falls are lightly veined red and are rounded and ruffled. The eyelash pattern almost completely covers the yellow signal. The name means "An Old Dragon". jpg IMG_9550-X2_roryu.jpg manage 150 K 12 Feb 2016 - 05:34 BrockHeilman Please contact Brock Heilman for image use.